Price and volume analysis is one of the most effective approaches to market analysis. It was pioneered by Richard Wyckoff, who worked on Wall Street during the golden age of technical analysis. 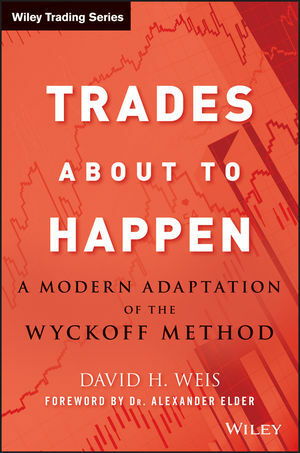 In Trades About to Happen, veteran trader David Weis explains how to utilize the principles behind Wyckoff's work and make effective trades with this method. Page by page, Weis clearly demonstrates how to construct intraday wave charts similar to Wyckoff's originals, draw support/resistance lines, interpret the struggle for dominance in trading ranges, and recognize action signals at turning points. Filled with in-depth insights and practical advice, Trades About to Happen promises to be the definitive work on utilizing Wyckoff's classic methods in today's turbulent markets. DAVID H. WEIS is a market analyst with nearly forty years' experience. He served as the director of technical research for ContiCommodities, Inc., during the mid-1980s. Weis has conducted seminars and workshops on technical trading throughout North America, Europe, and Asia, and is the recognized authority on the trading methods of Richard Wyckoff. He is the former editor of the Elliott Wave Commodity Letter, published by Robert Prechter, and the former editor/publisher of Technical Forces, a monthly market letter centered around price/volume analysis. Weis has also written numerous articles on technical analysis and is the author of Trading with the Elliott Wave Principle: A Practical Guide. He is the developer of the Weis Wave, a unique indicator that reveals the true force of buying and selling on intraday and daily charts. It is fully described in the text and on his website, weisonwyckoff.com.